It's mid-August; the bugs are gone, the night is back, and summertime in Iqaluit is fading. The cooler weather means its craft season in Iqaluit, so what better time than now to share with you two of my favourite parka projects to date: homemade dog coats for my furry friends. I finished Justin's parka near the beginning of December, a few weeks before he and I left on holidays. Planning to start my own, I decided to wait as I was going to be away for Christmas and so wouldn't need a parka until the new year. 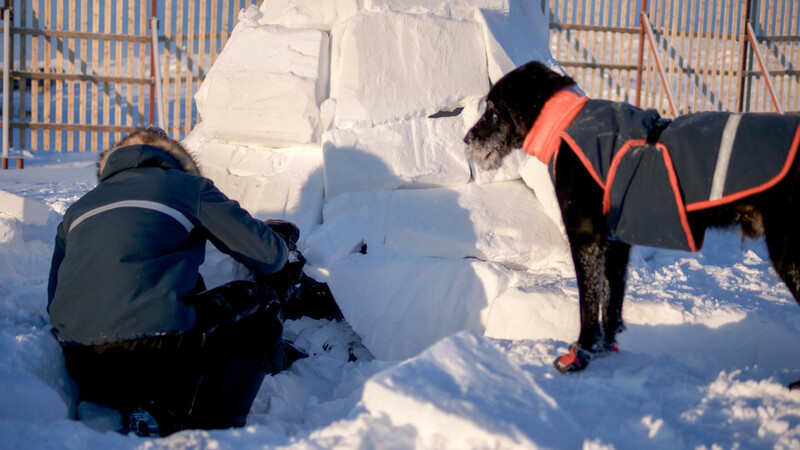 That's when I realized that Heffley, our lab-poodle cross and possibly Iqaluit's most famous dog, would be in the city all winter and was sans parka. Heff had made it through our first winter up here without a parka and boots, and his paws and body suffered for it. Please note that Heffley (full name: Heffley George Aleem Umilik Hack) is a bit of a wonder-dog: he has been to every province and territory except the NWT and Yukon, flown in helicopters, swam in the Arctic ocean, and camped in the bush for months on end. All that being said, he is not a husky and so not naturally equipped for harsh winters. Thus, I decided to use the leftover material from Justin's parka to make a dog coat for Heff. The boys in their matching parkas. Of course, the ladies at Tukisigiarvik did not teach me how to sew dog coats. So, the design for Heff's parka is inspired by the Great White North Winter Coat by Chilly Dogs. For the neck piece, I used a bright orange headband that Sandi Chan found at the thrift store. I then proceed to create a pattern by laying an old bed sheet over Heffley's back and tracing what I thought would be the right shape. After making a few adjustments, I had my pattern. While making this coat, I also learned a new parka trick. Most northern coats have three-layers, and the middle layer is cut from Thinsulate, a silver material that I've also heard called space tech. Starting with Heff's parka and for every coat since, I always cut and sew this layer first. Why? Because if I need to make any adjustments, say, lengthen the sleeve, or add a piece to the bottom, the patchwork will be hidden between two other layers of fabric! Any changes made can be incorporated into the original pattern (which is cut from that old bed sheet) and the two other layers, and no one will know of the Frankenstein layer within. You can see the silver material in the photo below. To finish the parka, I used orange bias tape to close all the edges and added two thick stripes of reflective tape, one on the front, one on the back for safety purposes. I don't know how much Heffley likes his parka, but I do know that when I reach inside of the coat to touch his back or chest, he is warm and dry. He might be proud to know that the Heffley Pattern for Dog Coats has since been used to create dog coats for a few other canine Iqalummiut. Now, I just couldn't make a coat for Heffley without also making one for Mario, our family dog and just about the weirdest Yorkie you'll ever meet. Mario holds down the fort at my home in Toronto, so when I went back for Christmas, I brought with me all the supplies needed to make the most adorable Inuit-style parka you have ever seen. All photos courtesy of my brother and incredible photographer, Ornab Momin. Again, there is no pattern for dog coats like this, but with the help of my mother and a lot of trial and error, I created a pattern specifically for Mario. For a Yorkshire terrier, Mario has very long legs and a very long torso, but not much girth. What this means is that off-the-rack clothes that fit him lengthwise are often too loose, and if they fit him around the body, they're too short. Of course, this custom-made parka is just right. The batting and Thinsulate layers of his parka came from scraps, but the outer shell is made from the material I had bought to make two parkas for myself. The red material is GORE-TEX, high-quality, high-tech fabric that is wind- and waterproof. The turquoise section is Commander, which is what you find on the outside of a Canada Goose parka. I decided to use a bi-colour design with trim as an homage to the North, where I learned to sew in the first place. Again, I included a thin strip of reflective trim for safety purposes. Oh, and that fur ruff? That's real coyote, scraps from the pelt I used for Justin's hood. You'll notice that Mario's hood is pointy. This style of hood is called kukukpaa in Inuktitut, and is characteristic of the Baffin region. Mario's kukukpaa is also fully-functional and can be pulled up to cover his head and ears when it's really cold or snowing. I somehow managed to finish this parka in the few weeks that I was home for the holidays. It was quite the experience, sitting on the living room floor with my mother, material and fur and paper strewn around us, cutting out tiny sleeves and bodices. It wasn't easy to sew such a small but thick item, and our client wasn't too enthused with all the measuring and fittings. It was, however, a real bonding experience between parent and offspring, as we threaded and coaxed my mum's old powerhouse of a Singer machine into stitching all of these layers together. The passage of knowledge from one generation to the other, the homage to tradition, the creation of a family memory - I had heard so much about the relationship between sewing and kinship during my parka course, and there I was, in a downtown Toronto condo, sharing that history with my own mother (thanks Mummy). On a more practical note, the completion of Mario's parka by January of this year was fortuitous as he and his fellow Torontonians were about to enter the worst of the polar vortex that saw temperatures below -29C in Canada's largest city. My brother reported back that no matter how cold it was outside, Mario's body was always warm under that parka. And for those of you who are curious, Torontomiut love Mario's Baffin-style parka. When they ask where they can get one just like it, my brother tells them to go to Iqaluit. What do you think of these homemade dog coats? Leave a comment and let me know!